The Advanced Textiles Research Group at Nottingham Trent University has developed a vibration sensing glove for the monitoring of hand transmitted vibrations. The aim of this article is to describe the developmental work leading to this innovation. 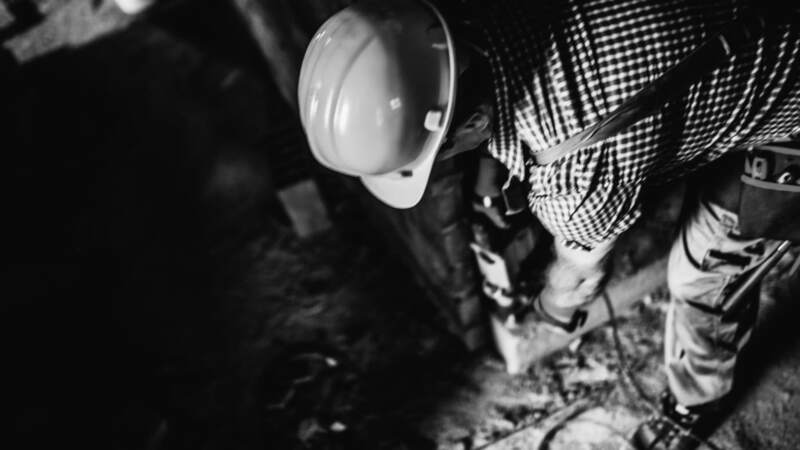 Vibration related injuries are a serious concern in the workplace and can lead to severe and permanent disorders, making the monitoring and reduction of vibration exposure paramount. Vibration related exposure falls into two general categories: whole body vibration and hand-transmitted vibration (HTV), which is often referred to as hand arm vibration (HAV) exposure. Estimates from the United Kingdom’s Health and Safety Executive indicate that almost two million workers in the UK are at risk, with experts in the United States also identifying that about two million people in the USA are exposed to HTVs, highlighting the large segment of society that this issue effects. HTVs are typically experienced from power tool use, ranging from hand drills to road breakers. As a consequence, injuries are principally experienced by workers in primary industries including construction, automobile repair and mining. HTV induced injuries typically take one of two forms: Hand Arm Vibration Syndrome (HAVS) or Carpal Tunnel Syndrome (CTS). Hand Arm Vibration Syndrome is often known as Vibration White Finger (VWF) due to the distinctive white colouration of the fingers of those suffering due to vascular damage restricting blood flow. HAVS is a secondary form of Raynaud’s syndrome, which is a condition where vasospasms of the arteries cause periodic reductions in the blood flow, with the vasospasms caused by nerve damage. In addition to aesthetic changes HAVS can lead to a reduction of sensitivity in the fingers, starting in the tip, which will become more severe if left untreated. In more extreme cases, muscle damage can occur resulting in a reduction in manual dexterity and grip strength; in these cases symptoms may also be accompanied by significant pain. Continued exposure to HTV will have an additive effect to HAVS suffers symptoms with transient effects becoming permanent with continued exposure, which can ultimately lead to finger loss. There is a direct relationship between the use of vibrating power tools and occurrences of HAVS and this has been well investigated within the scientific literature. Carpal Tunnel Syndrome (CTS) is not exclusively caused by vibration exposure and can be linked to other health conditions such as obesity, but the cause of CTS in most cases is unknown. Pathophysiologically the condition is instigated by the compression of the median nerve as it passes through the wrist. Repetitive motion is often cited as a cause of CTS in a workplace environment. Many studies have also linked CTS occurrences to HTVs exposure, with some work going as far as to suggest that workers are at an increased risk of developing CTS by vibration exposure levels below the safe threshold determined for HAVS. CTS can cause numbness in the hands, or discomfort or pain in the hands, wrists, or forearms. Other symptoms can include a reduction in manual dexterity or grip strength. In untreated cases CTS results in an atrophy in the muscle at the base of the thumb. The strong evidence base linking over-exposure to vibration and injury has resulted in a number of countries instituting legislation to limit vibration exposure. Within the European Union the EU Vibration Directive (Directive 2002/44/EC) dictates the maximum exposure for workers. Yet despite legislation, HTV related injuries still occur. In the last 10 years the Industrial Injuries Disablement Benefit scheme in the UK has seen 7,520 new claimants for HAVS and 3,860 new claimants for CTS. This not only highlights the importance of this issue but shows that current health monitoring measures are not adequate. There are a number of factors influencing hand transmitted vibration (HTV): the magnitude of the vibration, the frequency of vibration, and duration of the vibration exposure are all key factors. The magnitude of vibration is normally presented as an acceleration (ms-2 or metres per second per second). The frequency of the vibration is also critical as certain frequencies of vibration are more damaging to humans. To address this, acceleration magnitudes are frequency-weighted to account for how the frequency will affect the user. The weighting is described by the international standard ISO 5349-1:2001. The international standard defines a frequency range covered by the octave bands from 8 Hz to 1 kHz. However, according to the standard, frequencies around 16 Hz are the most damaging, with less of an effect at higher and lower frequencies. Vibration information when discussing HTV is generally given as a weighted acceleration. As the effects on the body due to vibration are cumulative, knowing the duration of exposure to vibration is also critical. A combination of the duration and weighted magnitude can be used to calculate a workers daily exposure (the daily vibration exposure, A(8)). The EU Vibration Directive stipulates that an employer has to take measures to reduce exposure at 2.5 ms-2 A(8) and places an exposure limit at 5.0 ms-2 A(8). The continuous monitoring of vibration exposure is not required by legislation. Instead a risk assessment is usually deemed adequate; this can be determined by either using vibration information provided by a tool manufacturer or measuring it using a transducer (normally a commercial vibration monitoring device is used). The vibration data can then be compared to the amount of time that a worker uses the tools and a daily exposure can be estimated. Figure 1: A schematic of the interior of an electronically functional yarn. The electronic chip is soldered to thin copper wires. The copper interconnects, chip, and a strong thermoplastic monofilament are encased within a UV curable resin to protect the ensemble from physical and chemical stresses (such as washing). The micro-pod and copper wires are then surrounded in fibres and a knitted textile sheath to give the final yarn the feel of a typical textile (not shown). The sizes given are typical for a temperature sensing yarn; with the microchip being a thermistor. Wearable devices for the monitoring of vibration exposure are also available commercially. Given the size of most sensors suitable for monitoring vibration these are normally wrist mounted devices or run along the side of the hand so that they do not interfere with the user. As stated in ISO 5349-2 the vibration measurement should be taken were vibration would enter the hand to provide a representative measurement; this would normally be on the palm of the hand. The importance of measuring on the palm of the hand with good contact with the vibrating surface is also highlighted by the UK Health and Safety Executive. The use of electronic textiles offers a potential solution, as a vibration sensor can be integrated directly into the textile that forms part of a work glove. In this way a sensor can be incorporated into the work glove that is completely undetectable to the end user. Sensors can be accurately positioned anywhere on the glove such as the palm or fingertips. This also offers the potential for integrating multiple vibration sensors which may prove useful in studies trying to better understand how HTV effects people or in developing antivibration gloves. Figure 2: A photograph of an example LED yarn. The produced yarn is very thin, about 2 mm wide in this example, and can be unnoticeably integrated into garments. Photograph courtesy of Ryan George. Yarns are the building blocks of textiles. The Advanced Textiles Research Group at Nottingham Trent University has developed an innovative electronically functional yarn concept which allows for small electronic devices, such as sensors, to be embedded into the structure of a yarn. These yarns are then used to create a textile that retains all of its textile properties such as breathability, drape and softness with an added electronic functionality. Critically the wearer cannot feel the integrated electronic chip or sensor. The development of the vibration sensor yarn first required the selection of a suitable commercial sensor to embed within the core of the yarn. Fig. 1 shows a schematic of the interior of a completed electronic functional yarn. The sensor had to be sensitive to vibrations within the range of interest while also being sufficiently small to embed within a yarn structure. Ultimately, the width of the final yarn is related to the sensor cross-sectional area, so for the comfort of the end user a sensor that is as small as possible is preferable. Other considerations also influenced sensor selection such as robustness, accuracy, and the linearity of a sensor’s response over the frequency and amplitude ranges of interest. The next consideration was the design rules for forming the resin micro-pod for the sensor. The active components of functional electronic yarns are covered with various layers to protect the encapsulated chip from chemical and physical stresses, as well as to make the final yarn comfortable for the end user to wear. After the sensor was soldered to the thin copper wires the chip was placed alongside a thermoplastic monofilament to increase the tensile strength of the yarn, otherwise tensile strain on the copper wire including those experienced during textile fabrication processes, such as knitting, could cause a breakage of the copper wire. The sensor, soldered connections to copper wires, and monofilament ensample were then coated in a UV curable resin. This resin micropod guarded the ensemble from mechanical damage and made the ensemble (and ultimately the finished yarn) washable. Figure 3: A photograph of the prototype vibration sensing glove. The glove presented is a commercial work glove with a vibration sensing yarn retrofitted into the gloves surface. Photograph courtesy of Ryan George. Understanding and engineering the resin micro-pod is a critical aspect of the research. Vibrations propagate through different materials depending on properties such as density. It is therefore vital to correctly select the resin type and geometry of the micro-pod to ensure that there is no negative interference on the collected data. The final stage of the yarn production process required covering the resin micro-pod and copper wires with fibres to give the final yarn a textile feel and mask the presence of the chip. This was achieved by feeding the micro-pod and wires into a small-diameter circular warp-knitting machine with a series of packing yarns. An example of the final yarn is shown in Fig. 2. The vibration sensing yarn can be integrated into a garment in a number of ways. The existing prototype glove has taken a commercially available work glove and retrofitted a vibration sensing yarn to it (Fig. 3) as a proof-of-concept. Other methods include knitting or weaving the yarns directly into a textile structure. A raw signal from the vibration sensing yarn is collected as an alternating current which is then recorded by the computer via an analogue-to-digital converter (at the time of writing various types had been investigated) at discrete time intervals. The collected signal takes the form of voltage against time, this signal is subsequently Fast Fourier Transformed (FFT) to produce a spectrum showing frequency against voltage (an example is shown in Fig. 4). Frequency peaks in the data correspond to the recorded vibrations. A peak-picking algorithm is then used to extract the frequency and amplitude of these peaks. By taking multiple readings over a discrete time interval continuously the frequency, amplitude, and duration of vibrations can be determined. In accordance with the ISO 5349- 1:2001 the frequency data could then be used to frequency-weight the recorded peak amplitudes and with the duration information, a vibration exposure level can be calculated. Figure 4: A demonstration of how the collected vibration signal is interrupted. At the top of the figure the raw signal is shown as a voltage (this is displayed here in arbitrary units) against time. The next part of the figure shows the fast Fourier transform of the signal, providing voltage against frequency. Finally, a peak peaking algorithm has been used to select the signals related to vibration from above the noise (shown with green crosses). Here peaks around 50 Hz and 100 Hz have been selected. Future versions of the glove will see data collected by a small microcontroller integrated with, or attached to, the glove. The data can then either be transmitted elsewhere for processing and storage or analysed on the glove itself. The latter solution would allow for the glove to warn the user if an exposure to over 5 ms-2 A(8) is exceeded, which is the exposure limit described by the EU Vibration Directive. Ongoing research is currently focussed on the optimisation and full characterisation of the vibration sensing yarn, and refinement of the supporting recording hardware. This new knowledge will be used to create a novel prototype glove; likely in the form of a glove that can be inserted within a commercially available work glove. Beyond creating a useful vibration monitoring solution for health surveillance, the vibration sensing yarns offer an exciting possibility to create a research glove with multiple sensors. As these sensors can be placed anywhere on the glove this may prove extremely useful in better understanding how hand transmitted vibrations effect people.